Button should be pressed and held until ECO PRO is displayed in the instrument cluster. This is displayed as the bonus range in the instrument cluster. 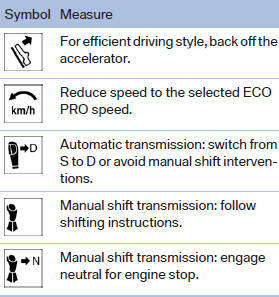 In the tachometer, a mark in the bar indicator indicates the current efficiency of the driving style corresponding to the accelerator pedal position. Set ECO Pro speed at which an ECO PRO Tip is to be displayed. A reminder is displayed if the set ECO PRO speed is exceeded.